This year, the event will be held directly after the holidays on December 28, where patrons Simon Cowell and Lauren Silverman will play hosts of the night. To add a splash of excitement this year, the event has moved to a new - and possibly even chicer - venue: the lovely Nikki Beach! Last year, the event was a hit with a fashion show, the usual exquisite eats and the lovely backdrop of the Apes Hill Golf Country Club. This year promises to be an even better showing, and the night will run from 7PM until 10:30PM, with the usual fanfare of sumptuous canapés and sinfully good cocktails. And, for the first time, there will be an afterparty for those who want to keep the energy going for a little longer. 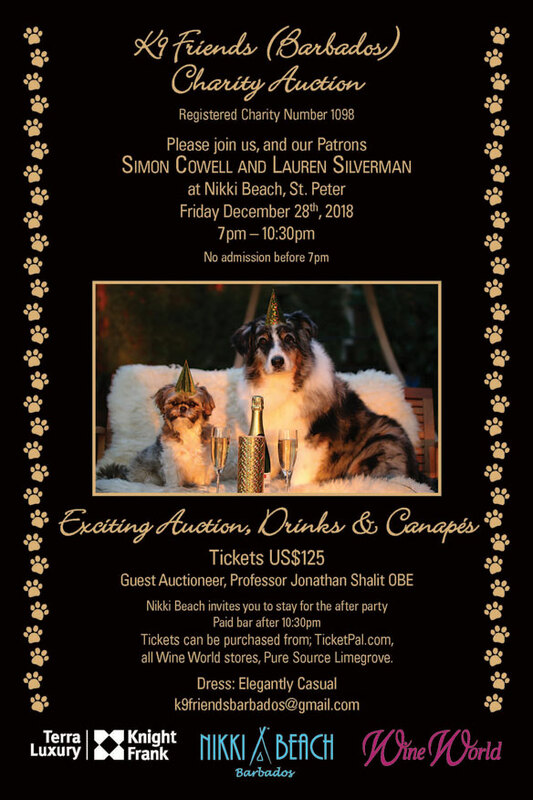 And, as usual, we at Terra Luxury have pledged our continued commitment to the charity, and along with Wine World and Nikki Beach, we are happy to be involved in the K9 Friends Barbados Charity Auction for yet another year! Founded in 2014 by Karen Millen and Danielle Mulligan, the animal wellness charity has spearheaded many initiatives that have made important strides in canine welfare in Barbados. Although considered a young charity when compared, in its debut year, the cause made an impactful mark and a strong show of staying power with an impressive taking of £100,000 in donations.